Since President Obama took office a decade ago, India and the US have drawn closer based on shared economic and political objectives; both nations are keen to tap each other’s markets, contain Chinese's regional influence and keep Indian Ocean shipping lanes open. The US is India’s primary source of export earnings and foreign investment, but growing economic ties now weigh on the relationship, due to President Donald Trump’s incendiary approach to trade and foreign policy. India joined the EU in retaliating against aluminium and steel tariffs levied by the US earlier this year. Broadened sanctions against Iran have left Indian exporters scrabbling to cut their exposures. Last month, the US offered India a sanctions waiver for imports of Iranian oil, but this will expire in May 2019. Trade tensions have spurred Rupee depreciation, driving politically sensitive inflation ahead of next year’s parliamentary elections. Exposure to Trump’s aggressive trade and foreign policy agenda is pushing India to hedge its bets. India and China have offered reciprocal tariff concessions and pursued a diplomatic detente. Prime Minister Narendra Modi also resisted US lobbying and returned to its preferred military supplier, Russia, purchasing a S-400 missile system for USD 5.2bn. India is now waiting to see whether the US imposes further sanctions for the deal or offers a waiver. Meanwhile, India has looked to Japan to establish a competitor to China’s Belt and Road Initiative, as rival Indian and Chinese interests continue to play out in a constitutional crisis in Sri Lanka. The derailment of the trajectory of Indian-US ties by America First policies demonstrates the limits of their leaders’ personal rapport and shared outlook. 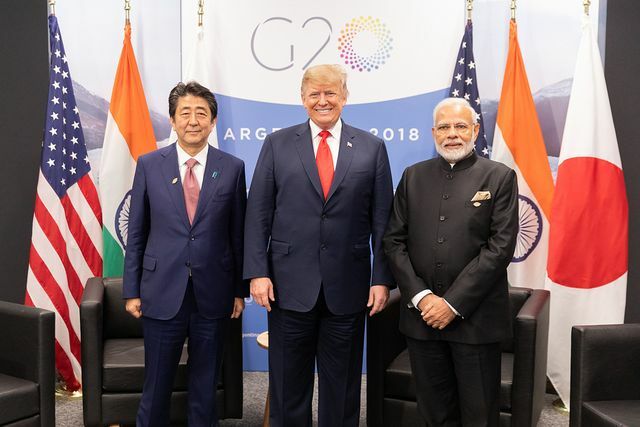 Efforts to blunt US trade policies will increasingly drive Asian geopolitics for the remainder of Mr Trump’s term, setting the stage for further confrontations between Washington and New Delhi.